1. 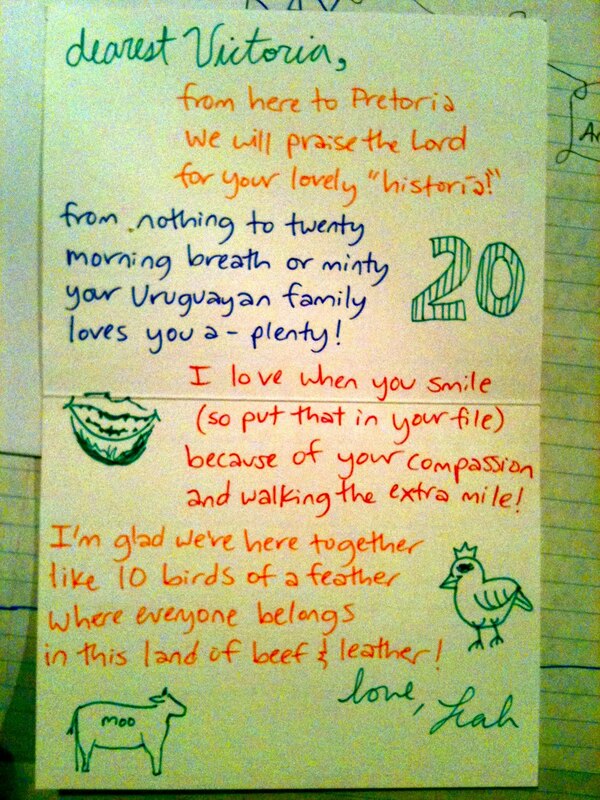 Today is the 29th, and here in Uruguay, it is traditional to eat ñoquis on this day every month. Ñoquis are a type of potato pasta, and if you find some pesos under your plate, you are sure to have good luck! Here is a link that has some different accounts of the origin of the southern cone ñoquis tradition: Ñoquis Explained! 2. 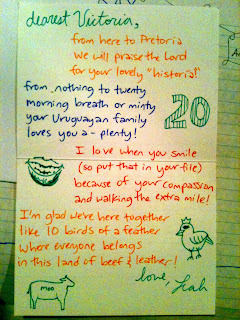 Here is a birthday poem I wrote for Victoria on Monday. She turned 20, and we love her. 3. Today I learned that cats in Uruguay only have 7 lives... bummer. I plan on advising all the cats I meet to head north when they start running low on lives. It's the least I can do. 4. Juuuuust a handful of alfajores help the eye-medicine go down, the eye-medicine go doooown, the eye-medicine go down! Well, obviously I have gotten behind on posting, and it is hard to know whether to backtrack or just continue moving forward. 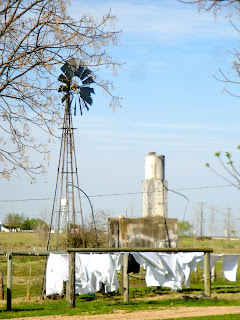 Since I left off at our trip to Buenos Aires, I think it will be best for me to do a quick burst of several posts concerning Argentina and our trip, and then continue. So be prepared for some serious shoving of Argentina into a nutshell! 1) I had a delicious asado at Alvaro and Maria del Carmen's house with their daughter, her boyfriend, and Ronnie. 2) Saturday began the "Días del Patrimonio," so there was a bustle of people, shops, museums, and shows through the city. It was also Michelle's birthday, so we took her to lunch at La Pasiva, and enjoyed the festivities in la Ciudad Vieja. We have found a cozy little place nearby to play pool, and we spent the evening there... soundtrack: U2. More unpredictable music in my life! 3) Sunday began with the usual format of church, and then lunch with Ronnie and Abuela. Afterwards, Ronnie, Kendyl and I went to Géant, a French shopping complex where he needed to get his Uruguayan ID renewed. Afterwards, we walked down the beach of Carrasco for a few hours, talking and picking up shells. This culminated in the three of us eating the best chivito in the world (from Marcos) in la Plaza Virgilio/la Plaza de la Armada that overlooks the city skyline and the salty sea. (The Plaza features a sculpture by Eduardo Diaz Yepes.) God has been good to me in all kinds of ways this week! Today was a series of unfortunate events... you know, those days that are so ridiculous, you can't help but laugh! Life is colorful, I want to share it. 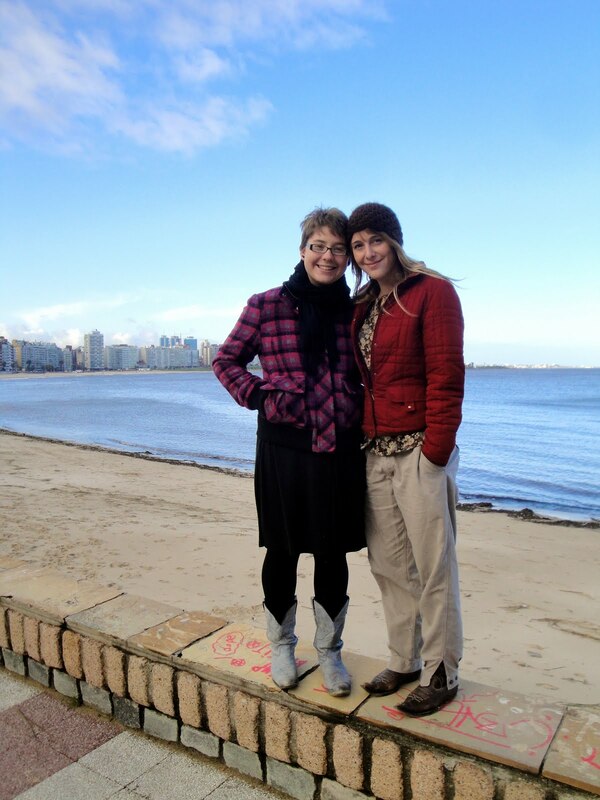 Our trip to Buenos Aires was great- we got to see and learn a lot in a short amount of time. The truth of the matter is, shortly after we got back, my boyfriend unexpectedly broke up with me. Because of this, I have not posted anything from our trip, but I will soon. I think it will be a good distraction for me. 1. Today is the first day of spring here. 2. Today is the anniversary of Artigas's (their national hero's) death in Paraguay. Today signifies the beginning of my spring. (Top) The first is the recently rebuilt Sodré interior. The original Hall burned down, but now the building is very modern and elegant. -The second is of Ronnie and his Mom before the show. -The next three were taken during the performance. Jorge seemed to be a very nice guy. He was able to improvise with wit, and it was obvious that he and the band were like brothers. Below are some video snippets I took during the show. (If they are not up, they should be by this evening.) Enjoy! This morning I woke up late to discover that my alarm clock (my phone) had died. I didn't mind because the sleep was precious this morning! Is anyone picking up on a recurring theme yet? (A picture will be added soon!) I liked the church where Alvaro and Maria del Carmen were married, which was right on the plaza. 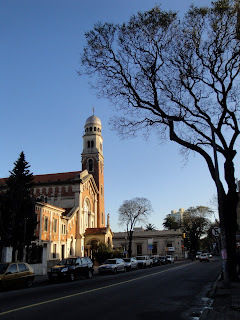 The city really was much more peaceful than Montevideo, which was a good change of pace. By the time we returned to the house, I was exhausted. Ronnie was generous enough to share his dinner with several of us at the house, which topped of a great day. Everyone went out to play pool tonight, but I decided that tonight is a night for La Paz. When you're constantly around people, sometimes it is good to be alone awhile and enjoy the calm and quiet. Thanks for sharing your peace with me today. Goodnight! Today we spent the day at the Estancia Don Joaquín, a ranch just a couple hours outside of Montevideo. We rode horses in the morning, had a traditional asado for lunch, swam in the heated pool, and then finished off with a lovely ride as the sun went down. My horse's name was "Tuviana" which is also the name of a red roan in spanish. It was one of the more rowdy horses in the bunch, and it also was the lead horse, which meant I was always at the front of the ride. We got along well, and ran like lightning at the end of each ride- quite the adrenaline rush! We found the ranch to be very nice, and the staff hospitable and friendly. Also, the Gaucho-man in charge of the horses asked me if I was Uruguayan after a short conversation :) This is probably because I didn't say much, but it was still a boost! 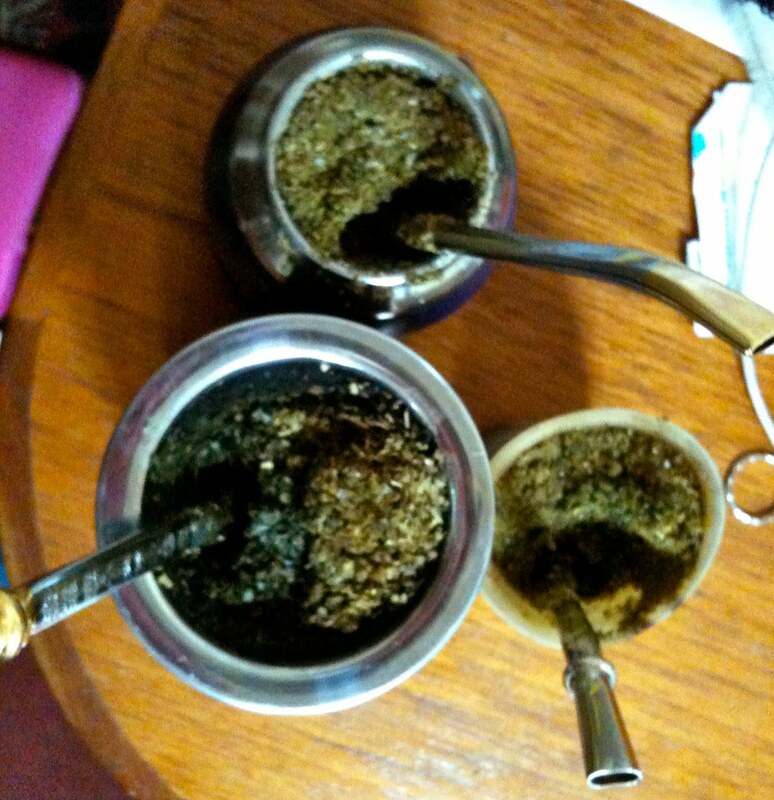 "Maté" refers to the gourd one drinks out of, or the drink in entirety. 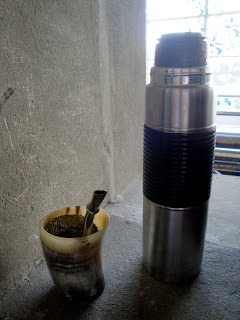 A "bombilla" is a metal straw that has a strainer at the base for drinking maté. The tip of many bombillas are golden, because people used to believe that the gold killed germs (important because the drink is often shared). 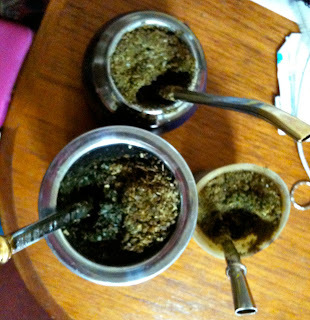 "Yerba" or "Yerba maté" refers to the actual tea leaves used. Maté is a social drink, and there are many little rules/tricks involved. The person who owns the maté and is sharing it is in charge. Only he/she pours the hot water and touches the bombilla with his/her hands. This person is also responsible for taking the first two drinks, because they are the most bitter. After filling the gourd about 3/4 full with yerba, he/she fills one side of the maté with hot water, making a "river" of water at the base of the "mountain" of dry yerba on the other side. After taking the first two drinks, the maté is refilled and passesd to the nearest person. Every person who drinks the maté must finish their gourdful, which is indicated by everyone acknowledging the empty noise. If someone decides they do not wish to be served any more maté, they say "Gracias." Otherwise, they simply return the maté and it will continue to be passed from person to person to everyone's contentment! Sometimes people will add orange peel or sugar to their yerba or water to change the flavor, but it is considered somewhat weak to do so. This is my maté, below. It is a bit strange because it is made from a horn! Uruguay and Buenos Aires share credit for the birth of Tango in the early 20th century. The dance has roots in a mix of dances, including Uruguayan candombe and milonga. It is a complicated and beautiful dance, often accompanied by extremely showy dresses, which are a contrast to the rather conservative clothing typical for daily wear. The music tends to be depressing, about the pain of lost love, and always at the fault of the woman involved. Today was a good day. I got to go with Ronnie to his mom's/Eric's grandmother's house for the afternoon. It smelled like my grandmother's house, which made me feel very warm and comfortable. We looked at several photo albums and talked about the family; it was a good way to spend a rainy afternoon. Also, the storm we are having is traditional, called the tormenta Santa Rosa, and it occurs at the end of every August! This one will have to be quick, but I will spruce it up tomorrow! Today was a bitterly cold, rainy, and windy day. After Bible, Caitlin and I made our first trip to the Universidad Católica for our "Latin American Thought" class, which is basically a literature class. The walk would have been short on a sunny day, but the icey water blowing in our faces made it feel like a long trek through the arctic! It was rewarding, however, to come home to some warm "tortas fritas," a sopapilla-like treat daten on rainy days! Yum! This evening Caitlin and I began our month-long commitment of volunteering to lead English Conversation Clubs at the Alianza. Our group included four men and two women, all in their 20's and 30's. 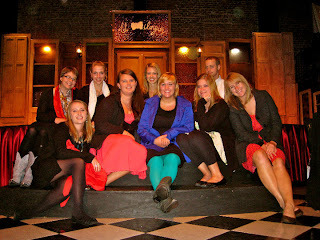 It took a little while for them to warm up to us, but once they did, it became a very enjoyable experience! One of the guys was an actor, and he had helped with a Uruguayan movie I had seen called " The Pope's Toilet." I thought it was neat! Also, one of the women has a dog that just had 9 puppies, and she desperately offered them to anyone interested! It has been a full day, and you know what? Today in 1783 a man named Santiago de Linieres was born. He later became the viceroy for the Viceroyalty de la Río de la Plata. If you're wondering why that is signifigant, Google the Río de La Plata! I am a student traveler spending 4 months in Uruguay, and traveling through the area. This is a pavilion for sharing the things learned, places explored, and experiences had while I am studying abroad. Enjoy! may your days have laughter and your comfortable shoes never wear out!